Archaeopteryx was first discovered in 1861, and was a very mysterious creature indeed, probably one that caused much debate and controversy. It had features of both a dinosaur and a bird. It had feathers, which is a feature of birds, but it also had teeth, a bony tail, and limbs that more closely resembled those of dinosaurs. “Hybrid creatures,” such as centaurs, half human and half horse, have been the subjects of many stories and mythologies. Imagine, if you will, a real creature that resembles two different types of animals in one! The name Archaeopteryx means old wing. Discovered in Germany it is sometimes called by its German name Urvogel, meaning "first bird.” It had feathers and wings, but its skeleton more closely resembled that of a dinosaur. It is true that at the time of its discovery birds were the only animals with feathers, so it would be logical to think that archaeopteryx was a bird. However, it also possessed teeth and bones in the tail, called caudal vertebrae. This is what made scientists scratch their heads, because birds typically do not have teeth or tail bones. The teeth were small and spiked, well suited for eating small creatures such as insects, worms, and lizards, among others. In any case archaeopteryx was the first bird like animal discovered. Many other bird like dinosaurs have been found since that time. However scientists have not yet found fossils of the first true bird. 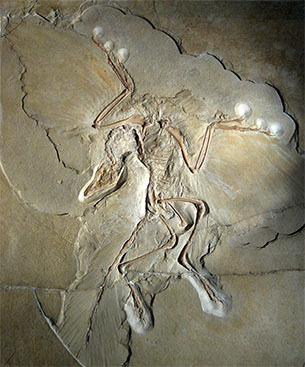 Most researchers do agree that the first bird probably desended from archaeopteryx. The family tree follows the saurischian-theropod-dromeosaur line and is most closely related to the raptors. The front limbs were held out by long upper arm bones, and had a wingspan of about 20 to 28 inches. Archaeopteryx had long feathers along its wings, that are ideal for flight. However, it lacked the proper muscles to help it fly. Modern birds possess a bony area called a “keel.” It is the flat part on the breastbone, and has strong flight muscles that the archaeopteryx did not have. It is possible that the archaeopteryx flew short, low distances, or perhaps they were able to glide from high tree branches. Due to the lack of keel though, the feathers were probably used for warmth and protection. 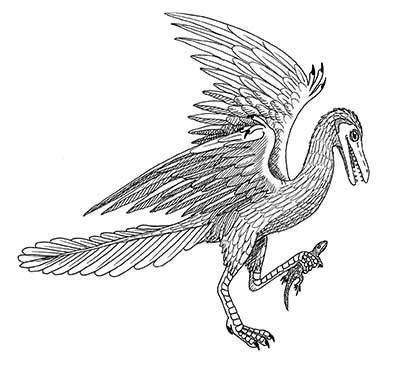 Another unique feature of the archaeopteryx were its claws. It had thee-toed claws, similar to modern birds, but the first toes was reversed so that it could grasp on perch on branches. Archaeopteryx lived during the Late Jurassic period, roughly 150 million years ago, in the western part of Europe. 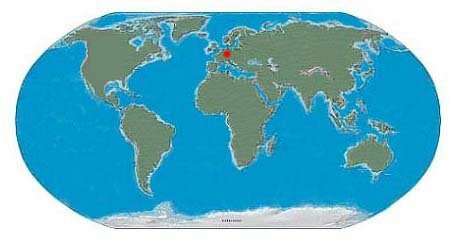 To date 11 specimens have been found all from the Solnhofen limestone in Germany. It was between 16 and 24 inches, about the size of a turkey, but weighed only 3 pounds. Archaeopteryx fossils were found with many other dinosaur species in limestone deposits, mostly found in a region in Germany. In fact, Archaeopteryx was often mistaken for another dinosaur, called Compsognathus because both lived in the same location and their fossils have been found in the same limestone deposits. However, the main difference between the two creatures is that archaeopteryx had feathers and composgnathus did not.